Franklin Simon & Co. was located at 414-416 5th Ave. around the corner east of this 38th St. address. Founded by Franklin Simon (1865-1934), the store opened in February 1902 and remained on 5th Ave. until the early 1960s. Franklin Simon was a native New Yorker, born Feb. 7, 1865. He started to work, when 13 years old, in the Stern Brothers' dry goods store 32-36 W. 23rd St. There he learned the dry goods business under the tutelage of Louis Stern. He stayed with Stern Brothers until going into business for himself at age 35. The original idea for Franklin Simon Specialty Shops was "to import much of his merchandise [from Europe] with a view to selling the imported goods as cheaply, if possible, as the domestic" (quoting Simon's obituary in the New York Times, 5 Oct. 1934 p. 23). Simon appears in the U S Census of 1870 as a 5-year-old living with his father, mother, and 6 siblings on Lewis St. (downtown on the East Side near the approaches to the Williamsburg Bridge, which, of course, had not been built at the time). His father was Henry Simon, an immigrant from Germany, who lists his occupation as "Wood Carver." One of his brothers, Julius Simon, is listed among his survivors in the Times obituary of 1934. Franklin Simon's two sons, Arthur J. Simon (1892-1968) and George D. Simon (1898-1944), as well as a son-in-law, Laurence Magee Lloyd (1893-1972), all served as officers in the company. Choice of a location for his new store made Franklin Simon a pioneer in New York retailing. In 1902 shopping clustered in the Ladies Mile stretch of 6th Ave. from 14th St. up to 23rd St. While others predicted the imminent movement of business up Broadway (Macy's, for instance, opened at Broadway and 34th St. in 1902), Simon foresaw the area of 5th Ave. north of 34th St. as the future of fashionable shopping. "Mr. Simon bought the home of Mrs. Orme Wilson, sister of the late John Jacob Astor, at 414 Fifth Avenue" (again quoting New York Times, 5 Oct. 1934 p. 23) and opened his store there. Franklin Simon & Co. was conceived as a collection of specialty shops rather than a traditional department store. Each "shop" had a specialty like those that sold ready-to-wear apparel for women, misses, girls, boys, men, young men and infants. Click for Madame's Gown Shop ad from 1926. By 1934 the store had expanded from an original 87 employees to about 3000. This ad from 1946 proudly touted Franklin Simon as "Fifth Avenue's First Specialty Shop." The building pictured above is a 7-story structure, immediately to the west of 8-14 W. 38th St. Both buildings have similar Franklin Simon signs. The one on 8-14 W. 38th is somewhat more faded: click for comparison. To the east of 8-14 W. 38th St. there was a narrower building at 4-6 W. 38th St. which stood next to the original Franklin Simon building at 414-416 5th Ave. Click for diagram of this arrangement as it existed in 1916. This diagram was drawn as part of a series of documents filed with the New York City Department of Buildings for proposed alterations to these buildings between the years 1915-29. 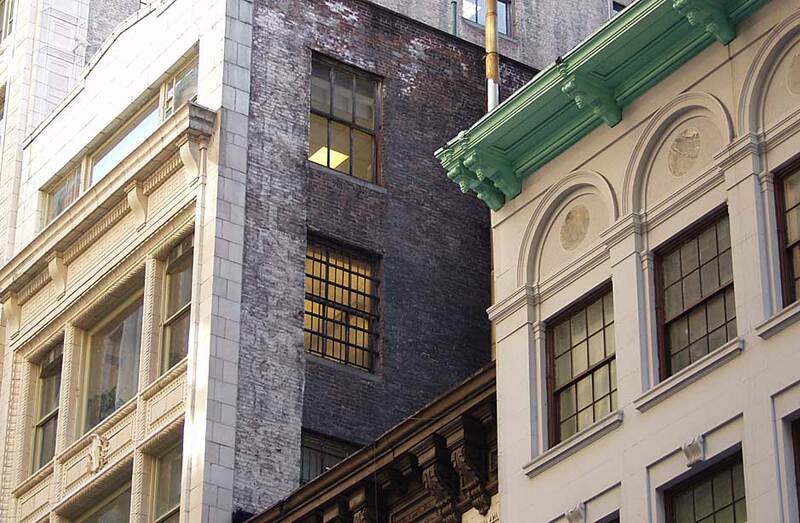 Franklin Simon used these buildings as extensions of its 5th Ave. store. A New Building Notice dated 1909 indicates that 8-14 W. 38th as well as 16 W. 38th (originally 6 stories; a 7th story was added later) were constructed in 1909. The signs, then, could date as early as 1909, but more likely belong in the period 1915-29 when most of Franklin Simon's reconstruction took place.